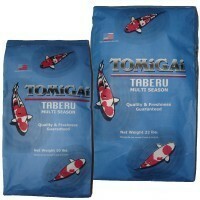 Taberu Koi Food with 35% Protein You can Feed All Year Around. Fortified with Probiotics presented to you ina Nitrogen sealed bag for Quality and Freshness. Ingredients: White fish meal, soybean meal, wheat flour, squid meal, garlic powder, fish oil, di calcium phosphate, choline chloride, L-ascorbyl-2-polyphosphate (vitamin C), vitamin A Acetate,, Vitamin D3 supplement, B Complex vitamins (riboflavin supplement, vitamin B12 supplement, niacin, folic acid, thiamine, pyridoxine hydrochloride, d-calcium panothenate, biotine), menadione sodium bisulphote complex (vitamin K), DLAlphatocopherol (vitamin E), calcium propionate.